What can you say about this but wow. Not only is this Australian native grass gorgeous, but it’s as tough as nails. If you trim YALBA™ Imperata back at the right time, your landscape can have beautiful fluffy plumes for 4 to 5 months. The best time to trim is early March. Trimmed then, Yalba can be the real star of your landscape all winter. YALBA™ with the botanical name Imperata cylindrical ‘ICL200’, is best planted as a monoculture, as it spreads and will dominate anything else planted with it. All this makes it brilliant at suppressing weeds, making large areas easy to look after. It usually gets up to 60cm high, which is much shorter than the common form, and grows, in just about any soil type including very poor soils. YALBA™ Imperata is super drought and frost tolerant, and Imperata cylindrical itself occurs in every state of Australia. It’s foliage takes on a reddish tone in winter, which contrast brilliantly with the feathery plumes. It’s great on road sides, where it should be slashed once per year, in median strips, on slopes for erosion control, or for any large mass planted area for home or commercial landscapes. Maintenance of YALBA™ Imperata is really low and easy, provided you follow the care sheet. Nara, a variety of Zoysia macrantha is the first and only general purpose native instant lawn in Australia, and this beautiful lawn I am sitting on is Nara. 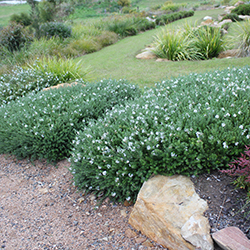 Native plants are so popular in Australian gardening because they are so drought tough, easy to care for, and are just so well adapted. Well Nara is a great addition for all those who prefer natives. But that’s not the only reason you would buy Nara native turf. Nara has so many benefits its easy to see why so many people are now going native. 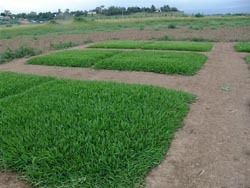 In drought studies, Zoysia macrantha was found to be more drought tolerant than Buffalo and Couch turf. Nara native turf also tolerates wet and humid conditions very well. Research proves it is far more salt tolerant than Couch, Kikuyu, Buffalo, and even all other types of Zoysia. It’s winter colour is better than exotic Zoysia types, and best of all Nara recovers well from wear damage, as it grows more quickly than all other Zoysia types. It is a low thatch variety of Zoysia meaning you can easily maintain it with any mower, and it will not get spongy on you, but best of all it needs far less mowing. Nara has moderate shade tolerance, coping with up to 40% shade. The real appeal form Nara is in its beauty. When people first see it they can not believe it is a native lawn. People often say this looks so much better than other lawns. Nara Native turf has now been used on many large projects, and is proving easy to use. As with all Zoysia types it just cannot be planted in Winter in colder regions. In Queensland it seems warm enough to install all year round. Now that Nara has proven itself to be a very reliable lawn, what are you waiting for? Go native. Nathan Layt from Ozbreed – Ozbreed are a well known environmental turf, landscape gardening and plant breeding company. Photo By Outdoor Design Source at GES on stand 102. 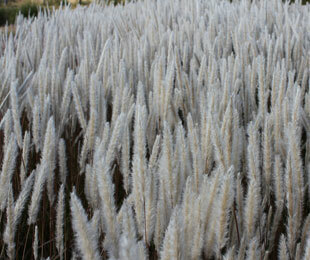 YALBA™ is extremely tough and an incredibly beautiful Australian native ornamental grass. Who’d have thought a grass could look so glamorous? Yalba’s fluffy plumes really are an eye catching feature for any landscape and can show for up to five months at a time (usually from April to August). Don’t be fooled though, this plant is much tougher than its fluffiness lets on. Yalba is a dense, fast spreading grass and is much more compact than common Imperata grasses, with longer lasting and more prolific flowers. Another great feature is its reddish foliage in autumn and winter, with green foliage in the warmer months. With its ability to out-compete weeds, Yalba is perfect for roadsides, median strips and large landscape areas, has excellent drought and frost tolerance, and tolerates poor soils. Yalba is so competitive in an area that it out-competes Couch, Kikuyu, and most other weeds. You only need to mow it once each year or two after it is established and that’s it! If any plant could ever be called bullet proof, I’d say Yalba is it. It’s also perfect for slopes and for erosion control as it strengthens the soil 5.45 times compared to bare soil.